"T E L O S"
Adama is from Lemuria, an ancient civilization. At the time, of Lemuria's height, Adama was an initiate in the Temples that were prominent at that time. After the destruction of Lemuria by Atlantis, Adama went underground with thousands of others, to establish Telos. Adama is not different from you, although I am hundreds of years old by now. So I have made the benefit of many life times woven into ONE. This has given me great insight and great wisdom, which most people don't begin to gather until the end of their short life span. So, living so many years definitely has its benefits. For me, I can astral travel to anywhere I desire. I can also telecommunicate to anyone in any locality of time and space. These are all things that everyone in Telos can do, because we've had the benefit of lifetimes of practice. So, Adama is not so different, just more experienced on how to use life's opportunities. You, on the surface, are situated ABOVE us, and BELOW the Ashtar Command. You are receiving LIGHT from above and below. You are between two great forces of Light. We here in Telos, watch over your surface population very carefully, monitoring your movements and reporting back to our councils. We know all that occurs on the Earth's surface. We embrace the Light as it dawns each day, and bless the darkness as it descends on our homes. We bless all of life's activities. We bless this great planet and all its life forms. We are grateful to be a part of this grand experiment. We are grateful to be a part of the Earth's great training ground where we are all being schooled in life's evolutionary process. Someday soon we are anticipating our emergence unto the surface. We await for this time - we pray for this time - when we can be reunited with our brothers and sisters again. 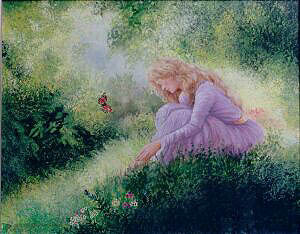 In the glory of the Light of God that is unfolding on the Earth plane. I AM ADAMA, and my love goes forth to you. Adonai. Q: How do you get to the underground city in Mt. 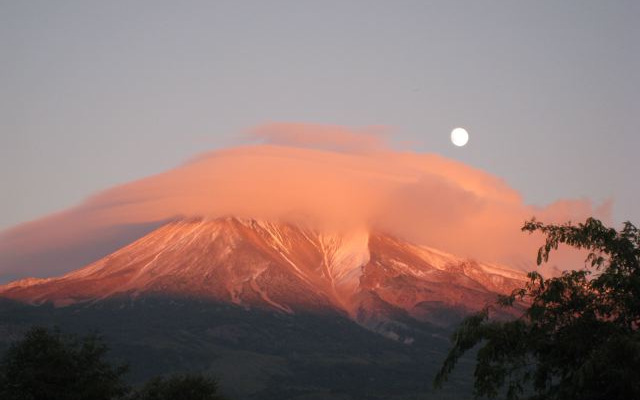 Shasta? A: Through the tunnels of course which are strictly guarded and camouflaged. Only our own people know the way. Soon, you too, will be given directions to locate us, and you will be met by one of us who will lead you through the underground tunnels to our city. It isn't far, just a mile beneath the ground, and once you're safely in the tunnels, there are conveyances that will take you the rest of the way. Please note: Mt. Shasta is very rough terrain. There have been serious accidents on the loose rock. Do not go wandering/climbing in this area without an experienced guide. You may practice astral traveling there. identified herself to Dianne as her Lemurian sister. Greetings from Telos, your sister city under Mt. Shasta in California, where over a million of us dwell. We reside here because the Earth is still too dense for us to travel to the surface. We await the time of less density and greater light, before we attempt to travel to the surface en masse. You will be amazed at the technologies that we will bring, for they will make life so simplified for you and so obvious, that you'll wonder how you didn't think of these things yourself. Well, you did, only it was eons ago in the past, and your memories don't recall them. We are all part of God's grand plan for the Universe, and WE ARE NOW MERGING OUR THOUGHTS INTO ONE THOUGHT FOR THE ENTIRE HUMAN RACE. Soon we will all be on the same wave band of consciousness, broadcasting our love and light to all in the cosmos and letting the cosmos know that we are ready to join with them in one grand FEDERATION OF PLANETS. This is Adama, wishing you a speedy journey in consciousness. Know that it is very "Light" here in Telos. Our Light is so bright that it lights up the Earth and the Heavens. We work closely with the Melchizedek Priesthood who are here to serve the Earth. We are very concerned about the progress that humanity is making on the surface. We, here in Telos, are very involved in the Earth's Ascension into greater Light. In Telos, we are Spiritual Warriors, as you on the surface must become. A Spiritual Warrior is one who acknowledges the Light within, and knows he/she is here for the purpose of bringing in more Light to Earth. So you are all here to bring in the Light. You do this by focusing on the light, always, and never letting it drift away from you. Visualize the Light as waves from the ocean, always coming in to you, and washing out the darkness. You are all great Light Beings who have come to earth, just as Adama has, to reunite all humanity into ONE HUMAN FAMILY. Adama has gained much wisdom from his extended life in Telos, and would like to impart this wisdom to others who wish to learn from him. Adama is currently conducting classes on the Inner Planes at night. If you'd like to register for these classes, just petition Adama before you go to bed at night asking to be his student. Adama will teach you mastery of yourself on all levels of existence. I speak to you today of the Glory of God - the God that resides in you. You are the receptacle of God. You hold God's Light - and your Light is so bright even if your are unable to see your own Light. Here in Telos, we are able to see each other's Light. We have developed our Inner Vision through meditation and prayer for aeons, until we reached this stage. You, too, are now on the brink of reaching this stage; the "time" when you clearly see the Light around you and the Light in others, as it reflects from the Central Sun into the core of your Being. YOUR SOUL IS LIGHT; and when you merge with your I AM PRESENCE, you bring the LIGHT from the Great Central Sun into the core, and you shine with the intensity of the Great Central Sun within you. For the Great Central Sun and you are ONE. We, here in Telos, learned this many aeons ago. Through our long life spans we were able to connect to the Cosmos in a higher frequency of Light and we were able to sustain this connection because we are not filled with thoughts of death or aging as you still are on the surface. Therefore, all we learned, we sustained; and what we all sustained enabled us to climb higher on the spiral of Life Immortal. So, we too will be celebrating the 12:12 event, and we invite you to join with us, here in Telos, as we will be joining with you on the surface. "Adama speaks on many subjects. His insightful messages include preparation for the next step in our evolutionary journey through eternity, the love of God for his creation, Oneness, attunement, Ashtar, life in Telos...and so much more. This reviewer was truly touched by Adama's words. For instance, "For once humanity feels God's Love directly from within, they will be able to understand their purpose for being here on Earth, and they will cease to feel the separation of their soul from God's Light. The citizens of Telos, formerly of Lemuria, are working towards the Ascension...they can astral project to anywhere and can telecommunicate to anyone in any locality of time and space. In these wonderful messages of enablement, Adama tells of our goal...to become a Spiritual Warrior - one who acknowledges the Light within...to reunite all humanity into one human family." Dianne Robbins wrote the 1st TELOS book ever published in 1992. 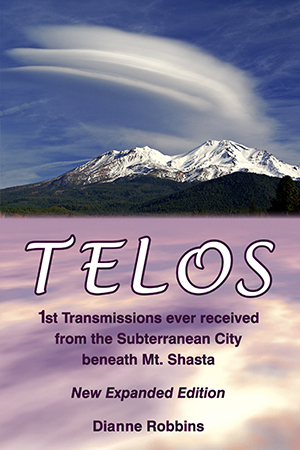 Her Telos book opened the way for people worldwide to make their own connection to Adama and the City of Telos. The messages in her book were dictated by Adama, word-for-word, and never edited. Each sentence carries the pure flow of energy from Adama that connects you to Telos through Adama’s own vibration. Explore the rich family life of the people from the Lost Continent of Lemuria, who have been living Underground for the past 12,000 years; and who, due to their isolation from the surface population, have created a civilization of peace and abundance, with no sickness, aging or death. Read about the Advanced Civilizations that live in peace and brotherhood in the Center of our Earth, which is Hollow, and contains an Inner Central Sun, with oceans and mountains still in its pristine state. "Books which explore the principles of the Universe from the perspective of the Sacred Inner Earth and its civilizations are rare. LAILEL's discourse opens the reader to the possibility of discovery that there are, indeed, worlds-within-worlds." "Telos eloquently and courageously addresses the understandings and actions necessary for a healthy society and environment. Telos and other spiritually and technologically advanced civilizations do exist, and are coming forward in these exciting times."